The oldest architectural monument of St. Petersburg. May 27, 1703 - the day of the founding of the Petropavlovskoy Fortress is also considered the foundation day of the city. 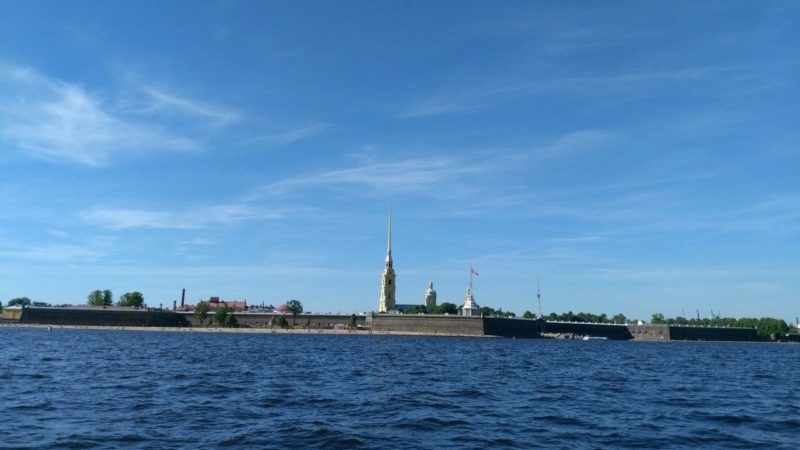 St. Peterburg was laid by Peter I on the land reclaimed from the Swedes. The citadel's plan was developed by the emperor himself, together with the French engineer Lambert de Geren. Let us recall the interesting facts from the history of the Petropavlovskoy Fortress, together with Natalia Letnikova. Fortress in the shape of an island. Outlines are a matter of military strategy. Laying the fortress, Peter used every meter of the Zayachiy Island - so that the Swedes threatening Russia had nowhere to land. Petropavlovskaya - the first fortress in Russia bastion type. It was built without fortress towers for round-robbing enemy ships. The Petropavlovskiy Cathedral is the tomb of Russian emperors. It was built simultaneously with the fortress, first in a tree, and from 1712 - in stone. With the transfer of the capital from Moscow to St. Petersburg, a new custom arose - to bury the crowned people not in the Arkhangelsk Cathedral of the Moscow Kremlin, but in Petropavlovsk Petersburg. By the end of the nineteenth century, the cathedral had 46 burial places and it required the construction of the Grand Ducal Tomb. The tallest historical building. 122 meters of the bell tower of the Petropavlovskogo Cathedral is not the highest point of St. Petersburg, but still the historical dominant. In the eighteenth century, due to a lightning strike, the spire tilted and the architectural monument was not damaged by the father of "industrial mountaineering" in Russia Petru Telushkin. Yaroslavl master six weeks climbed to the top of the rope ladder without forests and repaired both the spire and the soaring angel. The fourth angel of the Petropavlovskoy Fortress. There was a gilded figure on top of the spire under the cross in 1724 thanks to the architect of the stone cathedral, Domenico Trezzini. The first angel 30 years later "died" with a wooden spire from a lightning strike, the wings of the second were torn off by a wind of unprecedented strength. The third angel of 1778 rotated at the base of the cross, like a weather vane, and the current three-meter hovering angel crowned the spire after the reconstruction of the nineteenth century. Petropavlovskoy Fortress were fired only for peaceful purposes. What are guns talking about? The first cannon shot sounded in the citadel almost immediately after construction - at the time of the flag raising. The gun was firing, alerting the townspeople about the beginning and end of the working day. And since 1865 announces the approach of noon. In the twentieth century, the tradition was temporarily interrupted, and in the twenty-first century it developed: the presence of honorable guests at the salvo. Among them were the creator of the legendary automaton Mikhail Kalashnikov, Prince Charles, opera diva Elena Obraztsova. Bells and carillon sounds. 51 bell for four octaves. The heaviest - weighing more than 3 tons. The new carillon of the Petropavlovskoy Fortress - and a musical instrument, and once an international project. The first carillon appeared in Russia thanks to Peter I, but could not resist the fire of the fire of 1756. Director of the Belgian Carillon School Yo Haazen found more than 300 patrons, thanks to whom Petersburg received a 300-year anniversary of a new carillon weighing 15 tons. "The Russian Bastille." Fortress walls have often become a casemate for political prisoners. In different years in the Petropavlovka there were Decembrists, Narodnaya Volya, literati: brothers Bestuzhev, Nikolai Chernyshevsky, Fedor Dostoevsky, Alexander Radishchev. One of the first prisoners - the son of the founder of the fortress Prince Alexei. And the most mysterious history of the fortress-casemate, perhaps, is connected with the imprisonment of Princess Tarakanova. Secrets of the Nochnoy Fortress. Since 1924, the fortress has become a museum and even almost was destroyed a year later by the decision of the Leningrad City Councilfor the sake of the stadium. Today, the citadel is part of the Museum of the History of St. Petersburg with unique exhibits of the Museum of Cosmonautics, Artillery and Engineer Troops. On an excursion to the heart of the Northern capital you can visit even at night. Petropavlovskaya Fortress on the screen. The director's phrase "Camera! Motor! "Often sounds in the Petropavlovskaya Fortress. The architectural ensemble of the Zaytsev Island has already appeared in the pictures "Say a word about the poor hussar", "Treasure Island", "The Nose", "The Star of Captivating Happiness", "Mihailo Lomonosov" and in the movie guide "The Incredible Adventures of Italians in Russia". As one of the main symbols of St. Petersburg.